Sabrina is a Doctoral Candidate specializing in Educational Policy and Social Context (EPSC). Her research focuses on higher education policy, teacher effectiveness, STEM education, and the evaluation of education interventions. Sabrina received her B.A. in Economics from the University of California, Los Angeles. While serving as an academic counselor through the UCLA Early Academic Outreach Program, Sabrina developed an interest in working with young adults. 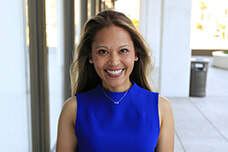 This experience motivated her to continue to impact young adults by becoming a public high school teacher after graduating with her MAT at the University of California, Irvine. Sabrina developed the economics program at Beckman High School, where she taught AP Microeconomics for several years. Sabrina’s experience as an educator allowed her to work with a diverse group of students. In doing so, she saw the challenges that the education system faces in educating all students equally. This motivated her to seek to better understand the problems in our education system and how to evaluate effective, evidence-based solutions. Prior to beginning her Ph.D., Sabrina received her Master’s in Public Policy from UCI. Her capstone project revolved around the impact of University Bridge Programs on college success for low-income, first-generation students. As a Ph.D. student, Sabrina has spent her time working on a number of diverse research projects that focus on improving the college experience and learning outcomes for students, using both quasi-experimental and experimental designs. She is currently completing her dissertation which is an evaluation of a one-year learning communities program for incoming Biological Sciences majors and its impact on both academic and non-academic outcomes.